I turned around a couple of hours ago to see two policeman in the restaurant I have found myself working in. They shut down the restaurant. Apparently Carnarvon (Australia), my temporary home, is on yellow alert. 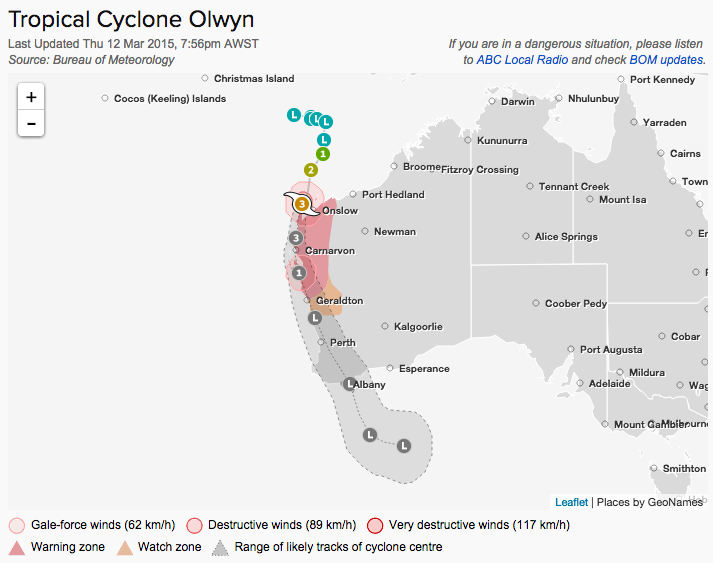 ‘Nearby’ towns (by Australian standards) have been put on red alert. “The three-stage cyclone alert system ranges from blue, where residents are advised to get ready for a cyclone, to yellow, which advises communities to take action and get ready to shelter, then to red, which is for when residents are advised to immediately take shelter.” Yellow alert means “There is a possible threat to lives and homes as a cyclone is approaching the area. People need to take action and get ready to shelter from a cyclone.” We have done as instructed. To an Englishman such as myself, the word cyclone is mostly associated with fancy vacuum cleaners. I do know (vaguely) what a hurricane is – thank you GCSE geography and American friends in Korea – and essentially, this is the same sort of thing. Wikipedia informs me “In the Atlantic and the northeastern Pacific oceans, a tropical cyclone is generally referred to as a hurricane (from the name of the ancient Central American deity of wind, Huracan), in the Indian and south Pacific oceans it is called a cyclone, and in the northwestern Pacific it is called a typhoon. I have been moved from my room in the pub / restaurant, to the nearby motel, along with many other people who have been evacuated from nearby towns. I have many litres of water, torches, and a fair few sandwiches. Supposedly the storm hits at 6am tomorrow morning, about nine hours from now. What will these strong winds bring? I have no idea, but it all seems quite exciting.